High performance semiautomatic sheeter with pedal and rocker arm for manual lamination reversal. Equipped with a 25 program Siemens computer managing the automatic lowering of the rollers with a max. of 35 passes for each program. Speed adjustable by means of an inverter in order to choose the best production conditions for each situation. 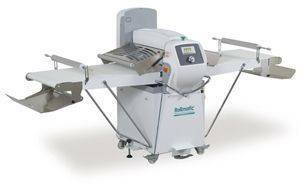 It meets the needs of the more demanding bakers due to its large rollers which provide a wide opening and a perfect lamination. Folding and removable tables for easy belt maintenance. Stainless steel protection grid with safety microswitch and gas piston lifting system.The cutting set option allows artisanal-industrial production.